Here’s a book that’s a good read. 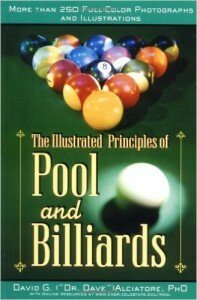 If you need to read something relating to billiards/pool I would recommend this one. This book caters to both billiards players who are complete beginners to seasoned professionals which I hope to be someday. What makes this book interesting is that it has colored photos to guide you into how to become a better pool player. To name a few techniques, you can learn how to perfect a bank shot, where to aim to hit a cue ball using your cue stick, and how to perfect combination shots. Another interesting note to point out about this book is that it also teaches you how to play a game of 8-ball and 9-ball. The author, Dr. David “Dr. Dave” Alciatore has a passion for billiards and has dedicated everything he knows to playing the game of billiards in this book. If you have any comments please add them in the comments section, and I’ll do my best to answer them. Thanks. Overtime, all new items in a household collects dust. So, if you want to avoid this, you might want to consider a cover to protect your billiards table. This can keep it looking like new and to play on for years to come. This can also prevent any unexpected scratches when the table is not in use. There’s this item on Amazon.com that I found that is reliable in protecting your pool table, and hope that you are satisfied with. I am sure that, in addition to protecting your table from dust, spills and damage, this item can also prevent the felt of your billiards table from discoloration especially on hot summer days when the table is exposed under direct sunlight. 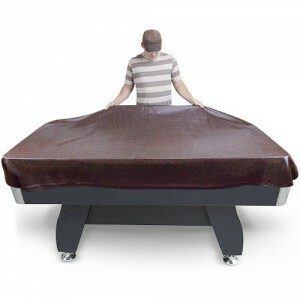 So, when it comes to table top protection for your billiards table, you cannot go wrong with this item. Instead of having only a wall rack which only holds cue sticks, you have the option of using a FLOOR rack. 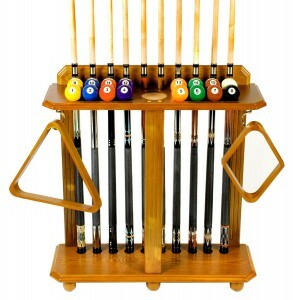 I saw this on Amazon.com and thought this would be a great alternative to the wall rack because not only does it hold cue sticks, but because it also holds the two ball racks and the pool balls as well. 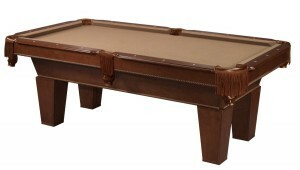 As I was looking for a Brunswick item to find for you to play quality billiards on, I stumbled upon this item on Amazon.com called the Fat Cat Frisco II 7.5-Foot Billiard Table. I know what some of you might be asking yourselves, “Why is this table not from a trusted quality like Brunswick?” Well, as it turns out when I was looking for a Brunswick-made pool table, I found this item instead. And, knowing that all the items are not going to be made from Brunswick, my focus of this site is find items that are the “best bang for the buck”. So, I went ahead and decided to promote this product as it has mostly good reviews from Amazon customers. You can add additional accessories to go along with the ones that are already included with the purchase of the table. I will provide them in the next post for your convenience. I hope this table satisfies your shooting pool gaming needs. I like the set up of your web page and the information is awesome. Hi Valrie! Thanks for stopping by and leaving a comment on this page. I continue to add as much relevant information as I can. Feel free to stop by anytime as I look forward to seeing you again. Cheers! I love this site especially because I love playing pull so much the layout the ideas they way you make everything a person needs to play pull so available the colors on your images are so appealing I am actually enjoying going through this site. Brilliant great site, I’m on games for kids but this is very cool and i can see its packed with lots of amazing info. Thanks Craig. I try to put the best products relating to my niche about billiards and gaming. May you be successful in your business endeavors as well. I’m confident any avid billard player will be able to find anything they need on your website. Thanks Dani. I will provide as much accessories/supplies relating to gaming, esp. billiards. There will be more posts relating to my niche in the days to come: Stay tuned. Great website, I’m very much impressed by what you’ve done so far. The content is well-written and researched, the layout visually appealing. A good range of posts and links for this little niche. Awesome website theme too. I find that the shorter paragraphs are easier to read, hope you find this helpful! Hi Thomas. Thanks for the feedback, and yes, I research my niche as much as possible to find the best possible products relating to billiards. In the future, I’ll add the best products relating to other forms of gaming such as Snooker and Air Hockey. I do my best to make this website user-friendly by making all my posts and pages easy to read. Cheers!